Do you remember the first time you got drunk? I certainly do and it wasn’t pretty! I remember having trouble walking, blurred vision, and couldn’t remember a thing the next day while having the worst headache of my life. Your experience may have been similar. While we know alcohol affects all of the body’s organs, it has the greatest affect on the brain, the most complex organ of them all. According to a 2015 study in the journal JAMA Psychiatry, 32 million people had a severe alcohol problem last year, which is a staggering 1 in 7 people. George Koob, director of the National Institute on Alcohol Abuse and Alcoholism even estimates that these numbers may be low because so many people are in denial about a potential problem and a significant stigma is still attached to pursuing treatment. If you feel you can relate to any of the issues below, seek the help of an available alcohol and drug rehab centers who can discuss these issues with your further. If not, chances are you know several people close to you who have a serious, alcohol-related condition. A lot of heavy drinking is done by college age students, most of who limit or stop their drinking once they join the working world. Many, however, keep going. The damage done to the brain by long-term drinking is quite striking, making it vital to seek the help of an alcohol and drug rehab before problems become severe. The longer you go, the worse it gets. 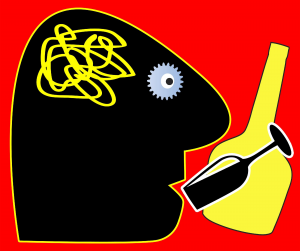 Heavy drinking over time can cause permanent damage to the brain. The liver’s reduced functionality allows the harmful by-products of alcohol into the brain, causing damage to existing brain cells and killing others. This can cause forgetfulness, slower memory recall, and slowed reaction times. Many people are aware that long-term drinking can cause damage to the liver, which has to constantly work overtime to break down the alcohol and clear it from the body. However, many people are not aware that some types of liver disease, such as cirrhosis can cause a brain disorder called hepatic encephalopathy. This disorder can cause drastic changes in mood, sleep patterns, and personality, as well as create extreme anxiety or depression. In extreme cases, some people get the “shakes”, which is a shaking of the hands. This can be fatal and people can fall into life ending comas. Everybody in this state should go to an alcohol and drug treatment center to get the help of professionals who can help detox them safely.